Golden Nugget – Las Vegas – Hotel Review – I Say! My first introduction to Las Vegas came through a TV show that I watched as a kid in Argentina called Vega$. Dan Tanna, a private detective played by the very good looking Robert Urich, went around the Las Vegas casinos solving crimes and helping get people out of trouble. The show had plenty of scenes involving show girls, cocktail waitresses and gambling rooms, and that’s what I think of when I think of Las Vegas. 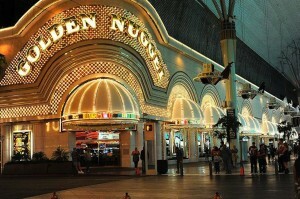 Staying at the Golden Nugget brought a little of that back, though the hotel has been modernized significantly. Our real reason for staying, though, was that my youngest daughter, Camila, wanted to go to its pool. The Golden Nugget has a very cool pool. It has a large, tall aquarium in the middle, which is full of pretty fish and sharks. A 3-story high slide circles around the aquarium, depositing you in the pool. The pool itself is pretty small, but I liked the in-water lounge chairs. As things turned out, neither my husband nor Camila were particularly impressed with the pool. The line to go up the slide was very long, which meant they only could go once, and the trip down is too fast to see anything. My 12-year-old, however, really liked swimming around the aquarium, and said that changing hotels for a night was worth it for that opportunity. The pool, by the way, is open until 8 PM in summer, though only until 5 PM in other seasons. We stayed in the Rush Tower. Our room was large and very nicely appointed with stylish furniture. There was plenty of storage space, though not as many easily accessible outlets as I wished. I particularly liked the modular sofa/lounge chair in the room. My oldest daughter was able to sleep there for the night, though I wouldn’t recommend it to anyone tall. The room doesn’t have a fridge, though apparently you can rent one. It has a TV but with few cable channels and no children channels. The room was fairly, but not completely, clean and ready. There was no toilet paper in the bathroom (though some was brought up immediately after we asked for it) and a dirty towel had been left in the bathtub. What would have been of larger concern, had we stayed more than one night, was the “view”. Our room was in the fifth floor and faced the roof of a building. There were too flood lights on these roof which were turned on at night, fortunately the curtains were heavy enough to not let any of the light come through. However, even with the curtains open, the room was very dark. We had to turn on the light to be able to see around, even during the day. I’d recommend that if you stay here, you ask for a room on a higher floor, and on the other side of the building (an even number room). The king size bed was quite comfortable, as were the pillows. All in all we all slept quite well. What I didn’t like about the Golden Nugget is how they nicked-and-dime you. Internet was $13 extra a day; the room had a coffeemaker, but if you wanted coffee you had to pay $10 for it. Mike and I did a little bit of gambling at the hotel’s casino, and I found it enjoyable enough, even though I lost. It’s a smoking casino – as are most – but the smell wasn’t too bad. It probably took 1/2 hour before a cocktail waitress approached me, but she was very nice and efficient when she did. I had to wait less later when we were playing roulette. We had dinner at Grotto, one of the more affordable (and yet, still expensive) choices at the Golden Nugget. I don’t know that I’d stay at the Golden Nugget again, mostly because I prefer the strip, but it’s a definitely a good choice if you want to stay downtown. It does feel much more intimate and comfortable than the hotels in the strip – but perhaps I perceived it like that because by the end of our four days in Vegas, I was tired.